Hello, O Digital Dynamo! Matthew Craig, here. I’m a writer from the West Midlands, and I’ve just opened a digital comic store here at Comicsy. My comics have run the gamut from adult drama to zombie romance, and include the adventures of my very own pet dog and a whole league of bostin British superheroes. 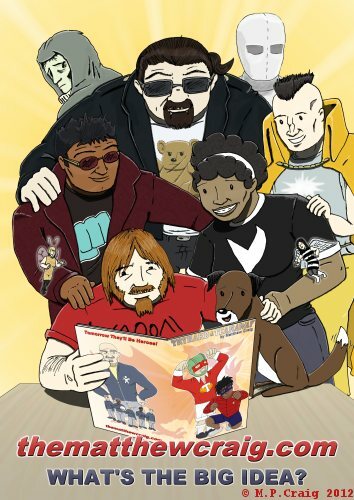 More recently, I have contributed to the Markosia anthology Bayou Arcana, and have a strip in an upcoming collection from Disconnected Press. I am always keen to work with artists and publishers on comics projects of all kinds. If you know anyone who might be interested, please feel free to point them my way. I hope you enjoy the comics you find here. I’ve priced them to sell, and packed them full of sketches and behind the scenes goodies. If you’d prefer print copies of these, or any of my comics, then please feel free to peruse the Shop on my main website. You can also find my comics in such fine locations as Nostalgia & Comics, Birmingham, Legacy Comics, Halifax and Legacy Comics, Laredo. Ask for me by name! I hope to be able to bring you some new and exciting strips in the months ahead, but until then, thanks for reading!